We aim to offer a wide range of extracurricular activities in order to ensure that, children are provided with opportunities to explore and develop their personal interests. At the beginning of the year each class is asked to create a clubs wish list. This list is then what members are staff use to decide which clubs they will support and run throughout the year. 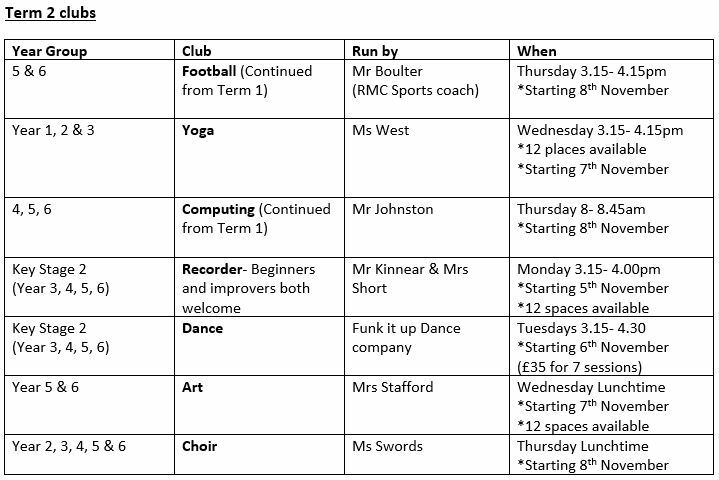 These clubs happen at either lunchtimes or after school. Clubs will often change on a termly basis and children’s opinions are recorded in order to ensure all activities are having as much impact on children’s learning as possible. Most clubs that we run are free, however if an outside company provides us with a club it will require a small fee. This will be stated on club letters that are given out.